You simply can't pile up enough adjectives when it comes to the general, who, at a relatively young age was already a runner-up for Time Magazine's Person of the Year in 2007. His record is stellar. His tactical sense extraordinary. His strategic ability, when it comes to mounting a campaign, beyond compare. I'm speaking, of course, of General David Petraeus, President George W Bush's "surge" commander in Iraq and, as of last week, the newly nominated head of US Central Command (CENTCOM) for all of the Middle East and beyond - "King David" to those of his peers who haven't exactly taken a shine to his reportedly "high self-regard". And the campaign I have in mind has been his years of wooing and winning the American media, in the process of which he sold himself as a true American hero, a Caesar of celebrity. As far as can be told, there's never been a seat in his helicopter that couldn't be filled by a friendly (or adoring) reporter. This, after all, is the man who, in the summer of 2004, as a mere three-star general being sent back to Baghdad to train the Iraqi army, made Newsweek's cover under the caption, "Can This Man Save Iraq?" (The article's subtitle - with the "yes" practically etched into it - read: "Mission Impossible? David Petraeus Is Tasked with Rebuilding Iraq's Security Forces. An Up-close Look at the Only Real Exit Plan the United States Has - the Man Himself"). And, oh yes, as for his actual generalship on the battlefield of Iraq ... Well, the verdict may still officially be out, but the record, the tactics and the strategic ability look like they will not stand the test of time. But by then, if all goes well, he'll once again be out of town and someone else will take the blame, while he continues to fall upwards. Petraeus is the president's anointed general, Bush's commander of commanders, and (not surprisingly) he exhibits certain traits much admired by the Bush administration in its better days. Recently, in an almost 8,000-word report in the New York Times, David Barstow offered an unparalleled look inside a sophisticated Pentagon campaign, spearheaded by former secretary of defense Donald Rumsfeld, in which at least 75 retired generals and other high military officers, almost all closely tied to Pentagon contractors, were recruited as "surrogates". They were to take Pentagon "talking points" (aka "themes and messages") about the president's "war on terror" and war in Iraq into every part of the media - cable news, the television and radio networks, the major newspapers - as their own expert "opinions". These "analysts" made "tens of thousands of media appearances" and also wrote copiously for op-ed pages (often with the aid of the Pentagon) as part of an unparalleled, five-plus year covert propaganda onslaught on the American people that lasted from 2002 until, essentially, late last night. Think of it, like a pod of whales or a gaggle of geese, as the Pentagon's equivalent of a surge of generals. In that impressive Times report, however, one sentence has so far passed unnoticed; yet, it speaks the world of Petraeus, and of how this administration and its chosen sons have played their cards from the moment Bush mounted a pile of rubble on September 14, 2001, at Ground Zero in New York City and began to sell his incipient "war on terror" (and himself as commander-in-chief). From that day on, the propaganda campaign, the selling war, on the American "home front" has never stopped. Here, in that context, is Barstow's key sentence: "When David H Petraeus was appointed the commanding general in Iraq in January 2007, one of his early acts was to meet with the [Pentagon's retired military] analysts." In other words, on becoming US commander in Iraq, he automatically turned to the military propaganda machine the Pentagon had set up to launch his initial surge - on the home front. By then, of course, the president himself was a thoroughly tarnished brand, not exactly the sort of face with which to launch 1,000 ships or even 30,000 troops into a self-made hell against the urgent wishes of the American people. Instead, he pushed forward his all-American general - the smart, bemedaled, well-spoken, Princeton PhD and counterinsurgency guru, beloved by reporters whom he had romanced for years, and already treated like a demi-god by members of both parties in both houses of US Congress. He became the "face" of the administration (just as American military and civilian officials had long spoken of putting an "Iraqi face" on the American occupation of that country). 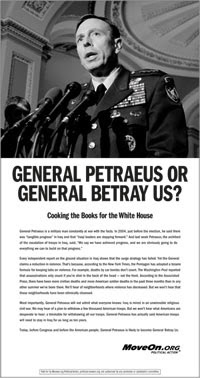 In the ensuing months, as New York Times columnist Frank Rich pointed out, the surging Brand Petraeus campaign only gained traction as the president publicly cited the general more than 150 times, 53 times in May 2007 alone. Never has a president put on the "face" of a general more regularly. Now, let's return to that single sentence from Barstow. Having been put forward by Bush as his favorite general and the savior of his Iraq policies, Petraeus seems to have promptly turned to the Pentagon's favored military "analysts" for a hand. The general's initial surge, that is, was right here at home via those figures the Pentagon had embedded in the media and liked to refer to as its "message force multipliers". Let's keep in mind that one of those figures, retired US Army General Jack Keane, a "patron" to Petraeus during his rise in the ranks, was, along with Frederick Kagan of the American Enterprise Institute, an "author" of, and key propagandist for, the "surge" strategy, as well as the head of his own consulting firm, on the board of General Dynamics, and a national security analyst for ABC News. So, in case you were wondering why the hosannas to Petraeus nearly reached the heavens and why the "success" of the "surge" was established so quickly in this country (despite four years of promises followed by disaster that might have called for media caution), look first to those surging retired generals and to the general who had already established himself as a military brand name. And let's keep in mind that the Times' Barstow has pulled back the curtain on but one administration program of deception. It is unlikely to have been the only one. We don't yet fully know the full range of sources the Pentagon and this administration mustered in the service of its "surge". We don't know what sort of thought and planning, for instance, went into the transformation of any Sunni insurgent who didn't join the new Awakening Movement and become a "Son of Iraq" into a member of "al-Qaeda-in-Mesopotamia" - or, more recently, every Shi'ite rebel into an Iranian agent. We don't have a full accounting of the many carefully guided tours of Iraq given to inside-the-Beltway think-tank figures like Michael O'Hanlon of the Brookings Institution, former military figures, journalists, pundits and congressional representatives, all involving special meet-and-greet contacts with Petraeus and his top commanders, all leading to upbeat assessments of the "surge". We don't have the logs of our "surge" commander's visitors these past months, but we know, anecdotally at least, that, during this period, no reporter, no matter how minor, seemed incapable of securing a little get-together time to experience the general's special charm. Put everything we do know, and enough that we suspect, together and you get our last "surge" year-plus in the US as a selling/propaganda campaign par excellence. The result has been a mix of media good news about "surge success", especially in "lowering violence," and no news at all as the Iraq story grew boringly humdrum and simply fell off the front pages of our papers and out of the TV news (as well as out of the Democratic Congress). This was, of course, a public relations bonanza for an administration that might otherwise have appeared fatally wounded. Think, in the president's terminology, of victory - not over Shi'ite or Sunni insurgents in Iraq, but, once again, over the media at home. None of this should surprise anyone. The greatest skill of the Bush administration has always been its ability to market itself on "the home front". From September 14, 2001, on, through all those early "mission accomplished" years, it was on the home front, not in Afghanistan or Iraq, that administration officials worked hardest, pacifying the media, rolling out their own "products", and establishing the rep of their leader and "wartime" commander-in-chief. As White House chief of staff Andrew Card explained candidly enough to the New York Times, when it came to the launching, in September 2002, of a campaign to convince Congress and the public that an invasion of Iraq should be approved: "From a marketing point of view, you don't introduce new products in August." As a general and a personality, Petraeus fit the particular marketing mentality of this administration perfectly. Graduating from West Point too late for Vietnam - he wrote his doctoral thesis on that war - he had, before the president's invasion, taken part only in "peacekeeping" operations in places like Haiti. In March 2003, a two-star general, he crossed the Kuwaiti border as commander of the 101st Airborne Division. After Baghdad fell, his troops occupied Mosul, a relative quiet city to the north, largely untouched by invasion or war. There, he gained a reputation (at least in the US) for having a special affinity for Iraqis and for applying top-notch, outreach-oriented counterinsurgency tactics. In those early months, he always seemed to have a writer in tow. In 2004-2005, for his next tour of duty - already with the ear of the president and of deputy secretary of defense Paul Wolfowitz - he eturned to Iraq as the Newsweek Can-He-Save-It guy. His giant task was to "stand up" Iraqi security forces. Again, he had writers in tow. The Washington Post's columnist David Ignatius, for instance, twice paid extended visits to the general during that tour, returning from helicoptering around the Iraqi countryside all aglow and writing glowingly of the job Petraeus was doing (as he would again over the years, as so many other journalists and commentators would, too). The general himself wasn't exactly shy on the subject of his accomplishments. He wrote, for instance, a strategically well-placed op-ed in the Washington Post in September 2004, just as the administration was rolling out another "product", the president's run for a second term. In it, with just enough caveats to cover himself professionally, he waxed positive about the glories of Iraqi soldiers standing up. It was a piece filled with words like "progress" and "optimism", just the sort of thing a president trying to outrun a bunch of Iraqi insurgents to the November 4 finish line might like to see in print in his hometown paper. The general picked up his third star on this tour of duty. Next came a stint at home where he oversaw the rewriting of the army's counterinsurgency manual, while touting himself as the expert of experts on that subject, too. And then, in February 2007, a fourth star in hand, he took charge of the US command in Iraq for its "surge" moment. Last week, Secretary of Defense Robert Gates appointed him head of the Pentagon's Central Command with responsibility for the wars in Iraq and Afghanistan, and for the proxy war in Somalia. His duties will soon stretch from North Africa into Central Asia. The appointment, however, came after the fact. By then, as Bush's personal general, he had already left the actual CENTCOM commander, Admiral William "Fox" Fallon in the dust. The president dealt with him directly, bypassing the CENTCOM commander; and, even before Fallon's ignominious resignation, Petraeus was already traveling the Middle East as, essentially, the president's personal representative, engaging in acts normally reserved for the head of CENTCOM. His appointment was seconded by presidential candidate Senator John McCain ("I think he is by far the best-qualified individual to take that job ..."), signaling the degree to which the Bush administration is now preparing optimistically for McCain's war (or, alternatively, for Senator Barack Obama's hell). But here's the strange thing when you look more carefully at Petraeus's record (as others have indeed done over these last years), the actual results - in Iraq, not Washington - for each of his previous assignments proved dismal. What the record shows is a man who, after each tour of duty, seemed to manage to make it out of town just ahead of the posse, so that someone else always took the fall. As the American commander in Mosul in 2003 and 2004, he earned adulatory press coverage ... for taming the Sunni-majority city. Petraeus ignored warnings from America's Kurdish allies that he was appointing the wrong people to key positions in Mosul's local government and police. A few months after he left the city, the Petraeus-appointed local police commander defected to the insurgency while the Sunni Arab police handed their weapons and uniforms over en masse to the insurgents. [Petraeus] rose to fame not by his achievements but by his success in selling them as achievements. He's first of all a great communicator ... Training the Iraqi military and shifting responsibility to them was the mantra Petraeus sold to hundreds of credulous reporters and hundreds of even more credulous visiting CODELs (congressional delegations)... By the time he left, the training program was clearly on its way to spectacular failure. By the end of last year that had become received wisdom; it became convenient for the brass to blame the fiasco on the politically less popular and media-friendless General George Casey. Entire brigades of police had to be pulled off the street and retrained because they were evidently riddled with death squads and in some cases even with insurgents. The Iraqi army was all but useless, a feeble patient kept on life support by the American military. Just recently, in hearings before Congress, Petraeus himself introduced two new words to describe the post-"surge" security situation in Iraq: "fragile and reversible". Take that as a tip for the future. Fragile indeed. The "surge" landscape the general helped create has, from the beginning, been flammable and unstable in the extreme. It has, in recent weeks, been threatening to break down in Shi'ite civil strife, even as, under an American aegis, the Sunnis have been rearming and reorganizing for the day when they can take back a Baghdad that was largely cleansed of their ethnic compatriots during the "surge" months. Americans are once again dying in increasing numbers (though little attention has yet been paid to this in the media), as are Iraqis. It will be a miracle if post-"surge" Iraq doesn't come apart before November 4, 2008, not to say the end of Bush's term in January. The problem is: putting a face - that is, a mask - on something has nothing to do with changing it in any essential way, no matter how you brand it and no matter who's listening to you elsewhere. This August or September, when the general takes over at CENTCOM, he will leave behind (as he has before) the equivalent of a mined stretch of Iraqi roadside ready to explode, possibly under the coming US presidential election. It remains to be seen whether he will once again have made it out of town in the nick of time and relatively unscathed. The miracle was that, so late in the game, the American media swallowed the president's (and the general's) propaganda on the "surge" campaign which, on the face of it, was ludicrous. Stranger still, they did so for almost a year before the situation started to fray visibly enough for US TV networks and major papers to take notice. For that year, most of them thought they saw a brass band playing fabulously when there was hardly a snare drum in sight. That result may be a public relations man's dream, but it was thanks to a con man's art. The question is: Can the president make it back to Texas before the bottom falls out in Iraq? And will the general continue to fall ominously upward? Tom Engelhardt, who runs the Nation Institute's Tomdispatch.com, is the co-founder of the American Empire Project. His book, The End of Victory Culture (University of Massachusetts Press), has been updated in a newly issued edition that deals with victory culture's crash-and-burn sequel in Iraq.